Come along and get creative in this drop in craft session. This weekend we will be making fairy jars. 10.00am - 12.00 noon & then 1.00pm - 3.00pm. The doors will close between 12.00 noon & 1.00pm. Our regular drop in craft sessions with a nature our environmental theme take place throughout the year. 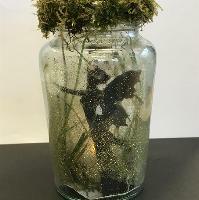 This weekend you will be designing and making your own Fairy Jar!